112 stunning photographs created during the production of the award-winning miniseries Lonesome Dove, starring Robert Duvall and Tommy Lee Jones. Lonesome Dove —Larry McMurtry's epic tale of two aging Texas Rangers who drive a herd of stolen cattle 2,500 miles from the Rio Grande to Montana to found the first ranch there—captured the public imagination and has never let it go. The novel, published in 1985, was a New York Times best seller and won the Pulitzer Prize for fiction. More than two decades after publication, it still sells tens of thousands of copies every year. The Lonesome Dove miniseries, which first aired on CBS in 1989, lassoed an even wider audience. Twenty-six million households watched the premier episode, and countless millions more have ridden with Gus and Call each time the movie has rerun on TV, video, and DVD. In addition to its popular success, the miniseries has also garnered unanimous critical acclaim. It was nominated for eighteen Emmy Awards and won seven. It also won Golden Globe Awards for Best Television Miniseries and Best Actor; a Peabody Award; the D. W. Griffith Award for Best Television Series; the National Association of Television Critics Award for Program of the Year and Outstanding Achievement in Drama; and the Writers' Guild of America Award for Best Teleplay (Bill Wittliff). Now bringing the sweeping visual imagery of the miniseries to the printed page, A Book of Photographs from Lonesome Dove presents more than one hundred classic images created by Bill Wittliff, the award-winning writer and executive producer (with Suzanne de Passe) of Lonesome Dove and a renowned fine art photographer. Wittliff took these photographs during the filming of the miniseries, but they are worlds apart from ordinary production stills. Reminiscent of the nineteenth-century cowboy photographs of Erwin Smith and the western paintings of Frederic Remington and Charles M. Russell, each Lonesome Dove image stands alone as an evocative work of art, while as a whole, they provide a stunning visual summary of the entire miniseries. 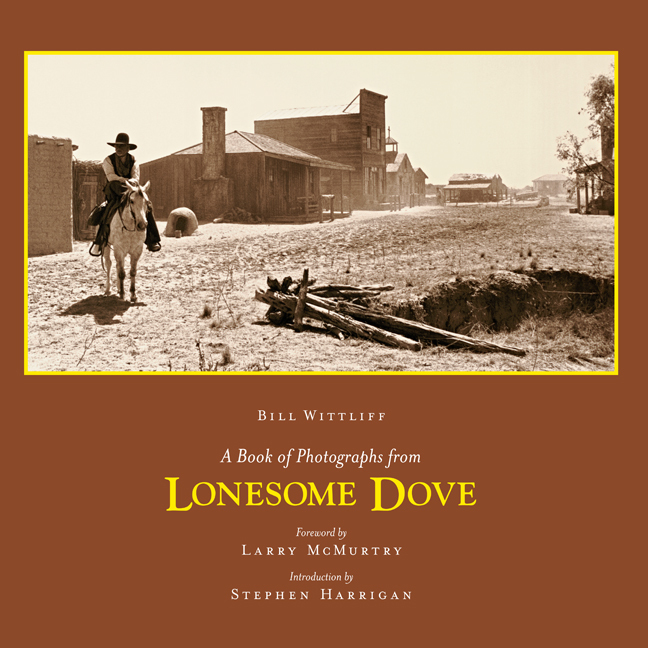 Accompanying the photographs are a foreword by Lonesome Dove author Larry McMurtry and an introduction by Stephen Harrigan, who describes the epic-in-itself creative journey that led to the making of the Lonesome Dove novel, miniseries, and book of photographs. In the afterword, Bill Wittliff recalls unforgettable moments—some hilarious, others momentous—from the production of the miniseries. A roster of the cast and crew completes the text. As its enduring popularity proves, Lonesome Dove conveys the spirit of the American West and the freedom of the open plains and sky as few other creative works ever have. For everyone who loves the novel and the movie, A Book of Photographs from Lonesome Dove provides yet another powerful way of experiencing this mythical, yet wholly real, world. Bill Wittliff, of Austin, Texas, is a distinguished photographer and writer whose photographs have been published in the books La Vida Brinca and Vaquero: Genesis of the Texas Cowboy and exhibited in the United States and abroad. With his wife, Sally, he founded the highly regarded Encino Press and the Wittliff Gallery of Southwestern and Mexican Photography and the Southwestern Writers Collection at Texas State University. As a screenwriter and producer, his credits include Lonesome Dove , The Perfect Storm , The Black Stallion , and Legends of the Fall, among others. The only book ever stolen from me was a first edition of Lonesome Dove , signed by Larry McMurtry at Watson's Bookstore in Austin shortly after the novel was published in 1985. I don't know who took it. One day about ten years after that book-signing event, long after Watson's had closed, I was sitting in my living room and had a strange premonitory urge to get up off the couch and check to make sure the book was still there. It wasn't. There was a three-inch gap in the bookshelf where it was supposed to be. No other books were missing, our house showed no signs of forced entry, and after weeks of searching it became clear that the book had not just been pulled down from the shelf and left lying around somewhere. It had been stolen, a targeted theft, an inside job. There had been workmen in our house that spring, and in those years of manic child-rearing, filled with never-ending cycles of birthday parties and sleepovers, there were always half-known visitors flooding in and out. Anybody could have taken it. Well, not anybody. The person who stole it had to have really wanted it, had to have been such a fan of Lonesome Dove that he—or she—was driven to a provocative act of theft right under my nose. I'm still too irritated to have any sympathy for this discriminating burglar, but there's a part of me that understands. Judging by the asking prices for signed first editions of Lonesome Dove on the Internet, my book is probably worth up to a thousand dollars by now, but I'm pretty sure this was a crime of passion, not of a simple desire for monetary gain. Almost from the moment Lonesome Dove was published, it was evident that it was one of those every-so-often-in-a-generation books that carry a transformative charge, both to its readers and to literature itself. It is the kind of book you take so personally, that you bond with so deeply, that you might very well end up resenting its popular and critical success, the too-public bestowal of acclaim on something you would prefer to believe was a secret discovery. I remember the feeling of being alone with Lonesome Dove after I started reading my now-purloined copy. I wasn't sure it was going to work at first. The first fifty pages or so struck me as fairly static, a lot of codgerly jabber and lazing around on the streets of Lonesome Dove and in the Dry Bean Saloon. And it troubled me that I could not get a focus on when and where the story was set. I had not yet realized that it was set nowhere but in Larry McMurtry's head, that it was not an historical novel but an ingenious concoction of whatever stray bits of authentic history, folklore, memoir, biography, and passed-down whimsy suited the author's purposes. If I had been a more observant reader, I would have understood earlier than I did that McMurtry had no interest in hewing to the historical or geographical record, but was magnificently unapologetic about having things his own way. And without the pokiness of those early chapters, without that quiet pool of inaction feeding slowly gathering channels of narrative, the book might have had too much starting power for its own good. As anybody who has ever shut out the world to read Lonesome Dove knows, this is a novel with a raging metabolism. Past a certain point in the story—I'd say about the time that Gus McCrae attacks that surly bartender—if it had moved any faster it might have burned itself out. The miracle of the book is how its unhurried character epiphanies keep pace with its runaway velocity. Woodrow Call and Augustus McCrae are one of those rare fictional pairings—like Sherlock Holmes and Watson, Captain Kirk and Doctor Spock, Jack Aubrey and Stephen Maturin—that are so alive with reverberant duality that a reader's interest in them is almost inexhaustible. Call is a locked-down personality, inexpressive, haunted and hampered by his emotional limitations. Gus is boundless, heedless, needling: alive with a passion that finally destroys him. But the deepening levels of these characters, and the extent to which they are fused together into one grand elegiac identity, are revealed so slowly and steadily that it almost feels as if the author is discovering the truth about these two men at the same moment as the reader. The reality, however, is that McMurtry had had Gus and Call in mind for a long time before he sat down to write Lonesome Dove . In the archives of the Southwestern Writers Collection at Texas State University in San Marcos, there is a document, labeled a "scenario," that was written by McMurtry in 1972 for Peter Bogdanovich, who had directed the movie version of McMurtry's The Last Picture Show a year or so before. McMurtry had shared screenwriting credit with Bogdanovich on that picture and, at the time he wrote this scenario, was in the early stages of a distinguished movie career. The title of the scenario is Streets of Laredo . It is a woolly hybrid beast, 288 typewritten pages long, made up of novelistic blocks of prose interspersed with awkwardly formatted dialogue, winning little asides ("Suggest," McMurtry writes in reference to the pet pig of one of the characters, "you get the Green Acres pig to play Marcia"), and marginal notes—presumably in Bogdanovich's hand—usually suggesting cuts. The manuscript is not a fully realized screenplay, but it is too fleshed-out to be considered an outline or treatment. It resembles, more than anything else, a furious first draft of a novel. The future Oscar winner of Brokeback Mountain was still a fairly green screenwriter, and there is a lot of unnecessary description and static whiling-away in this scenario. ("We go back to the porch," McMurtry writes at one point, "where there is still considerable inactivity.") Inactivity being the cardinal failing of screenwriting, it's not hard to understand how this movie never got made. Which was a fortunate development. Streets of Laredo , once it had been cooked down, might have made an interesting movie, but I find it hard to imagine it ever could have been the cultural benchmark that Lonesome Dove became. Written with John Wayne, James Stewart, and Henry Fonda in mind, it comes across as an ironic elegy to the passing of the frontier, its theme of western heroes who have outlasted their time not particularly groundbreaking in a period that was already full of washed-up cowboy movies like The Wild Bunch , Will Penny , and Monte Walsh . And the characters that would become Gus and Call were still struggling to be born. In the scenario, the proto-Call character is named John McCray, a "heavyset" former captain of the Texas Rangers. Augustus Evans, the one with the pet pig, strongly suggests the Gus McCrae that will emerge in Lonesome Dove , though in this early version he is introduced as little more than a bum, "mostly dressed in scraps and patches" and dozing away the afternoon using his sleeping pig as a pillow. The third character, the Henry Fonda role, is James Lee Driscoll. Driscoll is worldlier and better-dressed than the other two ex-Rangers, and wanted for the murder of a dentist. In the scenario he is very much an equal part of a triad, but as the iconic characters of Gus and Call emerged in the writing of Lonesome Dove he appears to have been downgraded to the role occupied by Jake Spoon. Unlike the novel that grew out of it, Streets of Laredo is specific. The book begins in Laredo, Texas, in "the late spring of 1874," and the characters are in their late sixties. But the nailed-down details only underscore the wisdom of McMurtry's decision, after the movie had fallen apart and he sat down to write a novel based upon it, to allow his story to hover in a vanished West of his own imagining. The Laredo in the scenario does not particularly evoke what Laredo, Texas, would have been like at that time, and the explicit reference to the characters' ages has the effect of focusing them too sharply, when one of the pleasures of the novel is trying to gauge exactly what they look like and what they might still be capable of. A scenario or treatment like this is basically a sales tool, a kind of prospectus. It is by necessity a didactic document, one that tells far more than it shows, and in which artistry takes a back seat to explication. You wouldn't expect Streets of Laredo to have the intensity of the screenplay Larry McMurtry might have written from it, or the movie that Peter Bogdanovich might ultimately have made with three of the era's most venerable movie stars if the project had gone forward. Even so, Lonesome Dove the novel is clearly a more cinematic vehicle than Streets of Laredo the proposed movie. It's swifter, sharper, grander, and more original. For example, one of the most wrenching and evocative extended passages in all of American literature—Gus McCrae's fatal encounter with Indians and Woodrow Call's heartbroken odyssey carrying his friend's body back to Texas—does not appear, even schematically. In the scenario, the Gus character does die, but in a somewhat-too-pointed encounter with an untamable wild stallion after the trail drive is over and the three main characters have returned to Laredo. Augustus clings to the stallion like Ahab clinging to the white whale as it slams him against a corral fence, the whole episode freighted with Hollywood-style end-of-the-West symbolism. When Lonesome Dove was finally published, western movies were in one of their periodic eclipses. A decade or so of preachy revisionist movies like Doc and Soldier Blue had drained away their mythic vitality, and whatever spark of interest was left had been snuffed out by the debacle of Heaven's Gate . I remember being surprised when Kurt Leudtke, who was about to win an Academy Award for his screenplay for Out of Africa , told me that the project he most wanted to do next was an adaptation of Larry McMurtry's Lonesome Dove . I had loved the book, but couldn't quite believe in the possibility of a big studio western in a period dominated by edgy urban dramas and gross-out college comedies. Besides, even a novice screenwriter like me understood that there was way too much story in Lonesome Dove to render into a feature movie of even blockbuster length. When, in the end, my friend Bill Wittliff was hired to produce and adapt the book as a miniseries, I still had my doubts. A television screen seemed like a perversely small frame for a story of such unparalleled openness. And if I had known then what I know now—after almost twenty years of writing movies and miniseries for television—I would have despaired. The budget restrictions of television; the squeamishness of network executives and sponsors about depicting violence or unwholesome situations; their desperate fear that viewers will change the channel at every commercial break unless some hokey cliff-hanger scene precedes it; the reluctance of major movie stars to be caught slumming on the small screen; the unceasing reliance on topical "triumph-of-the-human-spirit" stories—all these factors argued against the adaptation of a mammoth trail-drive novel. There were some iconoclastic spirits like Robert Halmi, Sr., and Suzanne De Passe behind the production, but I strongly suspect that if the assignment to adapt Lonesome Dove had gone to any other writer, someone with less clout, or less tenacity—someone, for instance, like me—the result would have been a marginally enjoyable but mostly forgettable movie. I would surely have argued for shrinking the story down, for taking out the whole subplot about July Johnson searching for his runaway wife, for excising any number of subsidiary characters that had no clear strategic purpose when it came to strengthening and clarifying the central storyline. I would have patted myself on the back for having cast a cold eye on a beloved book and having wrestled an unruly narrative to the ground. I did not understand how wrong I would have been until I went down to Del Rio to visit the production and Bill handed me a copy of his final script. It was long, immensely long: almost four hundred pages. I stayed up most of the night reading it in my motel room, and was amazed to see that everything was in it. None of the subplots or significant characters or winding narrative trails of the book had been cut out. It was a bracing thing to read, because clearly the assumption behind it was that Lonesome Dove was a great book, that CBS and Motown Productions and RHI Entertainment and all the other financing entities involved should feel privileged to adapt it, and that it had to be rendered with all its ragged grandeur and idiosyncrasies intact or it would not be worth doing. When I saw the set the next day I was even more encouraged. Carey White, the production designer, had built the town of Lonesome Dove on a high bank above the Rio Grande, and the place looked like it had been sitting there, moldering in the Texas weather, for many hard decades. I've learned over the years that I'm easily beguiled by movie sets, tricked by the magic and rigor of the set and costume design and the earnest industry going all around me into thinking that whatever picture is being filmed is going to be authentic and unforgettable—a judgment that is rarely ratified on the screen. In the case of Lonesome Dove , however, my first impression ended up ringing triumphantly true. Robert Duvall had originally been approached to play Woodrow Call, a role that his portrayals of unrevealing men in movies like The Great Santini and Tender Mercies argued for. But he had told Wittliff he wanted to play "the other guy" and now here he was, walking down the streets of Lonesome Dove , not just credible as Gus but instantly definitive, forever erasing from my mind the thought of what the character would have been like if James Stewart or Paul Newman or any of the other actors who had been mentioned at one time or another had ended up playing him. Filming had barely begun, and Duvall already seemed to have the verdict of history behind him, an aura that declared the casting of Gus could not have worked out any other way. Tommy Lee Jones as Call was more of an adjustment. I wasn't sure I liked his hat or his Kenny Rogers-esque beard, and when he delivered his lines there seemed to me more bounce in his voice than one would have heard emanating from the withheld Woodrow Call. The shrewdness and confidence behind his performance took a while to appreciate. Gus is the unforgettable, irresistible presence at the heart of Lonesome Dove but the story, in its deepest current, belongs to Woodrow Call. It's Call who is summoned to face the hardest truths about himself, to lose the friend who has challenged and defined him all his life, and to be left alive to confront a hollow future. Call is a puzzled and morose witness to his own fate, but Jones seemed to have recognized that this would have been a deadly note to sustain for eight hours. Perhaps for that reason there's a fascinating variability in the pitch of his performance, a humor and spryness that make Call's emotional imprisonment all the sadder. Toward evening of my first day on the set, I walked down a cutbank with Bill Wittliff and we stood watching as Simon Wincer, the director, filmed a scene in which Gus and Call and a few other horsemen cross the river into Mexico to steal cattle. The scene was attended by the usual artifice and clutter of a movie set—endless multiple takes, looming camera cranes, assistant directors barking into walkie-talkies, set dressers and propmasters and hair and makeup artists and wranglers rushing in to reassess their work at every opportunity. While the cameras were rolling, however, a stillness settled over this nameless stretch of the Rio Grande. It was magic hour, the movie term for the slow fade of day during which the light is richest. Everything always looks good at magic hour, but something else was going on here, and while it was happening Bill and I just looked at each other with astonished grins. We could hear the horses splashing through the water fifty yards away, we could hear the creaking of the high-backed saddles and the slap of a fish as it leaped in and out of the water. The cameras, booms, and reflectors were still there, the crew was still lining the bank, but we had ceased to notice these things. We were simply watching the horsemen cross the river, and we were smiling at each other because we were witnessing the same apparition. All of a sudden, it was real. Lonesome Dove had come alive. Bill had his Nikon with him and was taking pictures as he always did, but I was too focused on the suspended moment in front of us to remark upon his camera work. I had no idea at that point what kind of pictures he was taking. He was shooting with an ordinary single lens reflex camera on black and white Tri-X film. There was already an official unit photographer to take publicity stills on the Lonesome Dove set, and I just assumed that Bill, as the writer/producer of the movie, was making a private photographic record. In fact, he was making art. One of the exposures he took that day ended up as the photograph titled "Crossing the River," which is one of the signature images of this book. It is printed, like the other photographs, in archaic sepia tones, and every time I look at it—which is every day, since a print of it hangs on my office wall—it sets off a little mind-shiver, not just calling me back to that magic-hour river crossing but to someplace deeper and harder to reach, to a vanished time that is both wholly concocted and wholly real. These are not just pictures from Lonesome Dove , they are documentary images of something that seems to have really happened. The movie of Lonesome Dove exists on one plane, these photographs exist on another. They record an enterprise that was, like all movies, an elaborate attempt to trick us into believing that something is true when it is demonstrably not. But at the same time they seem to be turning up an unexpected layer of authenticity. Fictional movies require a suspension of disbelief; photographs typically do not. What's fascinating to me about Wittliff's Lonesome Dove pictures is the way they blend the make-believe of movies with the trustworthiness of photography. Look at the picture titled "Call with Herd," in which Tommy Lee Jones is sitting on a spotted gray mare, watching cattle as they are driven past. There is a certain cinematic vitality to it, but if you encountered it in a book of nineteenth-century photography there would be precious little to give it away. This photograph is not advertising a movie, it's not forcing a point, it's just recording a passing pastoral moment on the western frontier. The fact that the moment is manufactured, that Tommy Lee Jones is not some aging trail-driver but a then-41-year-old actor whose wrinkles are made of latex and whose stove-up posture has been thought-out and rehearsed, whose pistol is under the vigilant watch of the production's armorer and whose horse is only one of five horses playing the same animal—none of this undermines in the slightest the presence and force of the image. There is a frank and vibrant paradox in all of these photographs: the artifice itself is what makes them so credible. They all seem to have been taken in the same frame of mind Bill that was in when we were standing on the river bank that day and he could not hide his delight at how wondrously real everything had suddenly become. Lonesome Dove is a great book that had the rare fortune of being made into a great movie. More remarkable still is the fact that the movie took none of the magic away from the novel. You can watch one and read the other, and still respond to the integrity of both. The two manifestations of the story are mutually reinforcing. Looking through the photographs in this book, I think there is now a third generation of Lonesome Dove artistry. The pictures that Bill Wittliff took on the set of the movie have a stand-alone ghostly authority. The same creative power and conviction that allowed Larry McMurtry to transform his workaday scenario of Streets of Laredo into one of the greatest novels of our time, and that transformed that novel into the greatest western movie ever made, are on display in this book of Bill Wittliff's photographs. A Book of Photographs from Lonesome Dove is a masterpiece begot by a masterpiece begot by a masterpiece. It's the sort of book that might one day disappear from your bookshelf, carried away by a highly selective and passionate thief.